Sonic, What Have They Done To You? 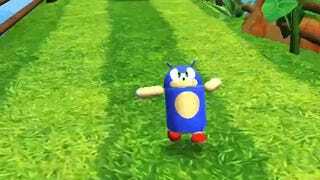 Today, the Android version of Sonic Dash updated with a new unlockable character. It's Sonic, in the shape of the Android robot. Andronic the Droid Hog, if you will. This is what he looks like. Stephen Totilo thinks the new character looks cute. I on the other hand can practically imagine this Sonic saying "please end my misery." Either way, if you want to play as this thing, you can download Sonic Dash on Google Play here—you'll need to play the game fifty times as the normal Android robot to unlock Andronic.